In West Coast Hotel v. Parrish, the Court held that states could impose minimum wage regulations on private employers. 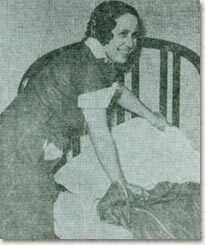 Above, plaintiff Elsie Parrish makes a bed. In West Coast Hotel v. Parrish (1937), the Supreme Court ruled, 5-4, that Washington State could impose minimum wage regulations on private employers without violating the Constitution's Fourteenth Amendment. The case sounded the death knell of the so-called "Lochner era," during which the Court held that the Fourteenth Amendment protects substantive economic rights against the state, such as the right to freely negotiate contracts and wages. West Coast Hotel ruled that no such right exists and that a state may constitutionally restrict the terms of private contracts when protecting the welfare of its citizens. In 1932, Washington State passed a law entitled "Minimum Wages for Women." It called for minimum wages for women and children as a means to combat "pernicious effects on their health and morals" and provided for a special commission, with input from industry and the public, to determine appropriate minimum wage levels. Elsie Parrish, a chambermaid at the West Coast Hotel, later sued the hotel in a state court claiming that it had not paid her the law's minimum wages. Parrish sought the balance of her income between what she was actually paid and the minimum wage (set at $14.50 per week of 48 hours). West Coast Hotel defended by arguing that the law was unconstitutional. The state court agreed and ruled for the hotel. Parrish appealed to the Washington Supreme Court, which reversed the lower court's ruling and directed that damages be paid to Parrish. West Coast Hotel appealed to the U.S. Supreme Court, which reviewed the case in 1936 and issued its opinion in 1937. The Supreme Court, in a 5-4 decision written by Chief Justice Charles Evans Hughes, ruled that the minimum wage law did not violate the Constitution's Fourteenth Amendment and Parrish was entitled to damages. The Fourteenth Amendment's Due Process Clause provides that no state "shall deprive any person of life, liberty, or property, without due process of law." West Coast Hotel alleged that because the minimum wage law prevented employers and employees from freely negotiating wages, it restrained "liberty" of contract without due process of the law. In response, the Court flatly declared that the "Constitution does not speak of freedom of contract" and that such a freedom is thus "a qualified, and not an absolute, right" under the Fourteenth Amendment. The Court argued that while the Fourteenth Amendment bans arbitrary deprivation of life, liberty, and property by the state (or protects "procedural" due process, e.g., a right to a fair trial), it does not prohibit the states' ability to "reasonably" regulate the terms of certain activities for the public good (does not protect "substantive" due process, e.g., the basic right to freely contract). The Court next ruled that the minimum wage law did not violate "procedural" due process because it was a "reasonable," not arbitrary, regulation. Though it interfered with contractual freedoms between "adults," the Court held that it was now reasonable -- given changing social and economic conditions -- for governments to set a floor under which wage levels could not drop. Ultimately, the Court held that the minimum wage law was constitutional because it reasonably regulated contracts to protect the health and welfare of workers. West Coast Hotel v. Parrish, sensibly as it reads today, was a radical and controversial departure in 1937. The decision directly overturned the landmark decision Adkins v. Children's Hospital (1923), which ruled that laws fixing terms of employment contracts violated the Due Process Clause because the clause protects a substantive right to freely contract labor ("substantive" due process). Although the Court's sudden rejection of "substantive" due process has sometimes been attributed to political pressures, because the decision was issued right after President Franklin Roosevelt proposed a "court-packing scheme" that would have added "anti-Lochner" justices to the Court to protect New Deal legislation, the Court actually voted on the case prior to Roosevelt's announcement of his proposal. The exact chronology of events aside, historians debate whether and to what degree the day's political climate affected Justice Josephus Roberts' unexpected switch -- sometimes referred to as "the switch in time that saved nine" -- to the pro-New Deal wing of the Court. West Coast Hotel's position on economic regulations remains settled law today. Alex McBride is a third year law student at Tulane Law School in New Orleans. He is articles editor on the TULANE LAW REVIEW and the 2005 recipient of the Ray Forrester Award in Constitutional Law. In 2007, Alex will be clerking with Judge Susan Braden on the United States Court of Federal Claims in Washington.